Though many are still learning about it, UV LED curing technology provides consistent and thorough curing, top production speeds, heat-less operation and high reliability with unprecedented uptime to flexographic printers. The ready availability of UV LED inks from major manufacturers, coupled with the ultra-high powered FLEXO and Blade Series award-winning XP Series LED curing technologies, gives printers the tools they need to achieve never-before-seen results in terms of quality, production speed and environmental friendliness. AMS Spectral UV's LED UV FLEXO Series is based on award-winning, patented dynamic collimation technology that enables the fastest, most intense curing of inks and coatings. 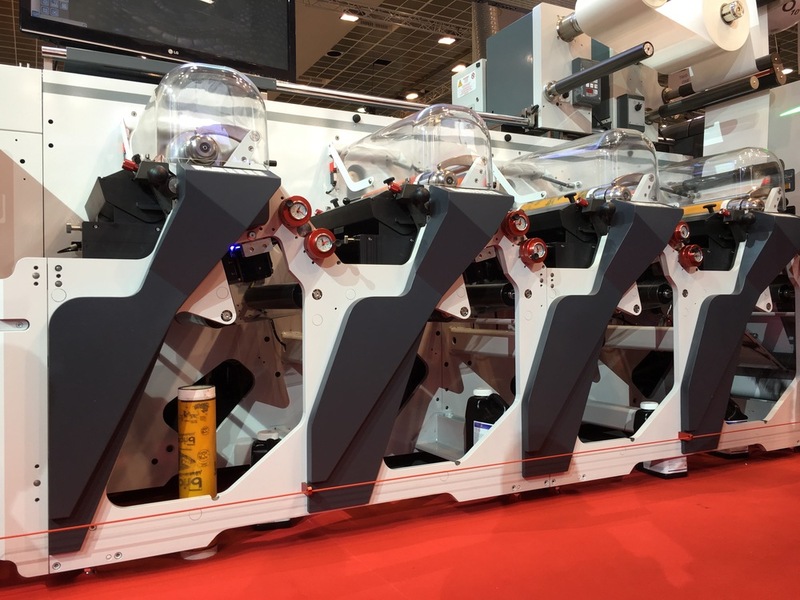 Market-leading AMS Spectral UV LED systems are moving Flexographic printing "full speed ahead" into a new era of cleaner, faster, heatless curing. Here OMET shows its latest 6-Color 430 Digital Flexo Label Press with AMS FLEXO Series LED UV on Vinyl and 12-micron PET. The highest UV-LED intensities are crucial for effective curing and attaining top production speeds in flexographic printing. Through a commitment to research and development of high-intensity UV LED, AMS engineers have made major advancements that allow printers to achieve incredible results with LED, which offers solutions to a host of issues they encounter everyday. The all-new FLEXO XP Series delivers 25W/cm2 (standard) and 32W/cm2 (optional) intensity classes at 385-395nm - our Blade Series LED-UV curing solution delivers best-in-class power of 50W/cm2. With these intensities, the raw power needed to solid-cure heavy blacks and opaque whites in flexographic production is readily available. And because curing power is optimized via our systems, intensity losses are minimized at reasonable working distances from the emitter window. The AMS FLEXO and Blade Series LED UV curing systems have been fully tested and qualified at the highest production speeds with the latest generations of UV LED inks from FLINT Group, Nazdar and other manufacturers. Shrink films, pressure-sensitive labels and other tough-to-cure applications can be readily handled by LED-UV curing as well, thanks to the fact it is a low-temperature process. Why Opt For A Flexible, High-Power LED UV System? Modern tag and label converters rely predominantly on air-cooled mercury (Hg) UV arc-lamp systems that routinely suffer from downtime due to excessive heat, lengthy warm-ups, shutter malfunctions, equipment failures and other faults. Curing quality degrades promptly from the time that each bulb is installed. Once production begins, heat is blasted into the pressroom, putting stress on air conditioning and air-recovery systems, and hazardous ozone leaks are not uncommon. With conventional air-cooled UV systems in the flexographic space, costly downtime, speed bottlenecks and inconsistent production results are almost inevitable. LED-UV technology provides a cost-effective solution to these issues. The AMS XP9 Series UV LED module delivers the highest UV LED intensities available, and can be sized to meet any press or web width requirement. Our FLEXO Series package includes the power drivers, cooling, web mounts and controls necessary to deploy quickly on just about any machine. AMS FLEXO Series is perfect for high-speed flexible packaging applications involving PET and shrink films, where heat is traditionally an issue. 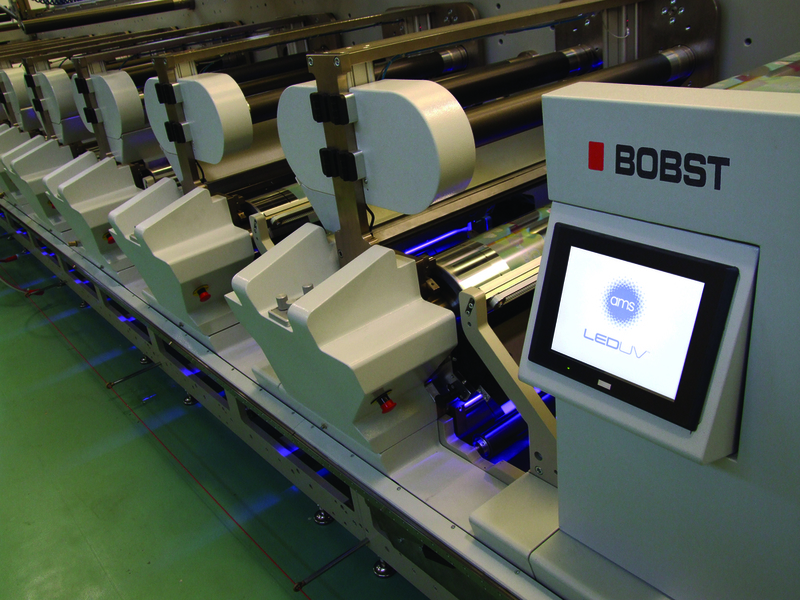 Here AMS LED UV is installed on a BOBST Gidue 9-Color M 630 (25-in) Mid-Web line Designed for Flexible Packaging. AMS LED Lamp Units integrate transparently to flexographic presses in a more optimal way than traditional UV lamps, which require bulky housings, hot air exhaust blowers and standby shutter systems. AMS FLEXO Series LED UV lamps fit easily into flexographic print units where they achieve faster production speeds, less heat and higher quality output, without mercury and ozone, and with energy savings of 60% or more compared to traditional UV lamps. Thanks to ongoing advances in the power, intensity, and efficiency of UV LED curing systems, along with the commercialization of a new generation of LED flexographic inks and coatings, LED-UV curing solutions are available TODAY and are set to revolutionize the way curing is accomplished in the tag and label industry. Whether starting with just one, two or three lamps to remove curing bottlenecks in the existing process, or converting the entire press, AMS LED UV systems are very compact, low profile and easy to install just about anywhere the web travels. AMS LED systems can be specified in any length to meet the large variety of web widths in the market today, and our universal UV LED web mounts are quick to install. Press integration is accomplished quickly via normal interface points, and can expand to cover a host of integration requirements. For new presses, our OEM packages can be specified so that your press comes equipped with LED-UV. AMS UV LED technology can be specified on new presses, and is easily retrofittable onto existing machines from numerous manufacturers including Gallus, Nilpeter, Mark Andy, Omet, Comco, MPS and others. AMS works closely with press manufacturers to ensure the highest integration quality is achieved, and automation features of the machines are preserved. AMS has worked closely with tag and label converters on the deployment of UV LED, and has developed an in-depth understanding of the success factors and ROI drivers. Rather than starting from scratch, we encourage you to contact us and to leverage the models we already have in place.